New research suggests that a compound abundant in the Mediterranean diet takes away cancer cells’ “superpower” to escape death. By altering a very specific step in gene regulation, this compound essentially re-educates cancer cells into normal cells that die as scheduled. One way that cancer cells thrive is by inhibiting a process that would cause them to die on a regular cycle that is subject to strict programming. This study in cells, led by Ohio State University researchers, found that a compound in certain plant-based foods, called apigenin, could stop breast cancer cells from inhibiting their own death. Much of what is known about the health benefits of nutrients is based on epidemiological studies that show strong positive relationships between eating specific foods and better health outcomes, especially reduced heart disease. But how the actual molecules within these healthful foods work in the body is still a mystery in many cases, and particularly with foods linked to lower risk for cancer. Parsley, celery and chamomile tea are the most common sources of apigenin, but it is found in many fruits and vegetables. The researchers also showed in this work that apigenin binds with an estimated 160 proteins in the human body, suggesting that other nutrients linked to health benefits – called “nutraceuticals” – might have similar far-reaching effects. In contrast, most pharmaceutical drugs target a single molecule. “We know we need to eat healthfully, but in most cases we don’t know the actual mechanistic reasons for why we need to do that,” said Andrea Doseff, associate professor of internal medicine and molecular genetics at Ohio State and a co-lead author of the study. “We see here that the beneficial effect on health is attributed to this dietary nutrient affecting many proteins. 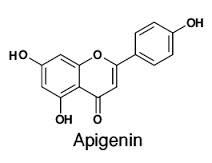 In its relationship with a set of specific proteins, apigenin re-establishes the normal profile in cancer cells. We think this can have great value clinically as a potential cancer-prevention strategy.” Doseff oversaw this work with co-lead author Erich Grotewold, professor of molecular genetics and director of Ohio State’s Center for Applied Plant Sciences (CAPS). The two collaborate on studying the genomics of apigenin and other flavonoids, a family of plant compounds that are believed to prevent disease. The research appears this week in the online early edition of the journal Proceedings of the National Academy of Sciences. Though finding that apigenin can influence cancer cell behavior was an important outcome of the work, Grotewold and Doseff point to their new biomedical research technique as a transformative contribution to nutraceutical research. They likened the technique to “fishing” for the human proteins in cells that interact with small molecules available in the diet. “You can imagine all the potentially affected proteins as tiny fishes in a big bowl. We introduce this molecule to the bowl and effectively lure only the truly affected proteins based on structural characteristics that form an attraction,” Doseff said. “We know this is a real partnership because we can see that the proteins and apigenin bind to each other.” Through additional experimentation, the team established that apigenin had relationships with proteins that have three specific functions. Among the most important was a protein called hnRNPA2. This protein influences the activity of messenger RNA, or mRNA, which contains the instructions needed to produce a specific protein. The production of mRNA results from the splicing, or modification, of RNA that occurs as part of gene activation. The nature of the splice ultimately influences which protein instructions the mRNA contains. Doseff noted that abnormal splicing is the culprit in an estimated 80 percent of all cancers. In cancer cells, two types of splicing occur when only one would take place in a normal cell – a trick on the cancer cells’ part to keep them alive and reproducing. In this study, the researchers observed that apigenin’s connection to the hnRNPA2 protein restored this single-splice characteristic to breast cancer cells, suggesting that when splicing is normal, cells die in a programmed way, or become more sensitive to chemotherapeutic drugs. “So by applying this nutrient, we can activate that killing machinery. The nutrient eliminated the splicing form that inhibited cell death,” said Doseff, also an investigator in Ohio State’s Davis Heart and Lung Research Institute. “Thus, this suggests that when we eat healthfully, we are actually promoting more normal splice forms inside the cells in our bodies.” The beneficial effects of nutraceuticals are not limited to cancer, as the investigators previously showed that apigenin has anti-inflammatory activities. The scientists noted that with its multiple cellular targets, apigenin potentially offers a variety of additional benefits that may even occur over time. “The nutrient is targeting many players, and by doing that, you get an overall synergy of the effect,” Grotewold explained. Doseff is leading a study in mice, testing whether food modified to contain proper doses of this nutrient can change splicing forms in the animals’ cells and produce an anti-cancer effect.